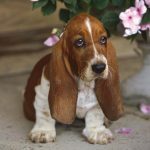 The short-legged Basset Hound is a member of the hound family bred to hunt rabbits. 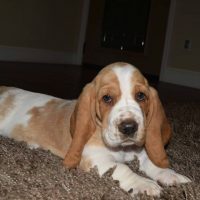 Characteristics such as long, floppy ears, an extended length, and sad, often droopy, eyes make this dog both adorable and unique. 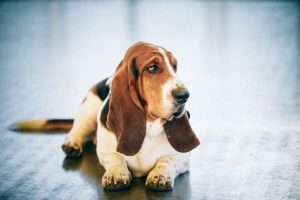 Their superior sense of smell is only surpassed by the Bloodhound when it comes to tracking, but their pleasant-natured personality and good-natured social skills make this dog a wonderful household pet. 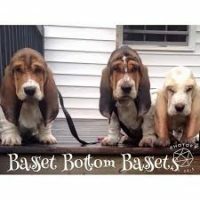 The Basset Hound gets his name from the French word “bas” which means low. This breed is definitely low to the ground, but because they are heavy boned and quite muscular, they weigh more than one would expect. Males will range anywhere from 51 to 64 pounds while the average female weighs between 44 and 60 pounds. Females are typically 11 to 14 inches tall while the male is slightly taller at 12 to 15 inches. A closer look reveals that this breed is actually a big dog with very short legs. This is due to a form of dwarfism known as achondroplasia. 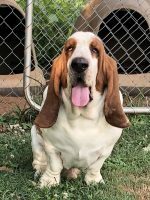 Even though they are pretty large in size, the Basset is notorious for believing that it is a tiny little lap dog and loves to be held. 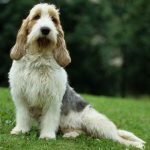 The Basset Hound has short, hard-textured fur that lies smooth. This breed is relatively easy to groom, and they come in a variety of colors. The most recognized is the classic tri-colored pattern that includes tan, black, and white. The open red and white coloring consists of red spots on a white background while closed red and white refers to a solid red coat with a white tail and feet. You will also come across the lemon and white coats that appears to have soft tan spots on a white coat. Occasionally you may find one with all gray fur. These are called Blue Bassets, but the color is undesirable as it is thought to be the result of a genetic problem. This breed is a loyal and affectionate dog. They get along well with other pets, people, and children due to their instinctive pack nature which makes them an ideal family pet. They love to play, but this dog does enjoy long naps, sun-bathing, and relaxing with their family at the end of the day. They often bark to alert their owners when someone approaches their home, but they will make friends quickly once they are introduced to a new person. Keep in mind that this breed likes to do things their way and only once they are good and ready. Although stubborn, they are not aggressive. Training can be challenging, but patience, a gentle hand, and food rewards are most effective when trying to get them to respond. The average lifespan of this hound is eight to twelve years. They are prone to several health conditions such as gastric torsion, OCD, elbow dysplasia, entropion, thrombopathy, otitis externa, glaucoma, canine hip dysplasia, and Von Willebrand’s Disease. Many of these issues are caused by their unusual shape. They also have a tendency towards obesity that can cause back problems. Patellar luxation is another concern, and veterinarian exams may include hip and eye exams as well as platelet tests due to these common issues. Daily play outside and walks on the leash will help keep this breed healthy. The wrinkles on the face, especially around the mouth, need to be kept clean to avoid infections, but the coat requires very little grooming. 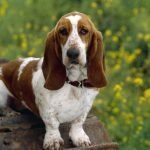 The Basset Hound is a wonderful house pet, but it was originally bred as a hunter. They have been mentioned by name as early as the 16th century when referring to badger hunting. The French are credited for using them in hunting before the Revolution because of their slow gate and short legs that are easy to follow along with their excellent scenting abilities. Although they are most commonly found hunting hares, they can be used for larger game as well. 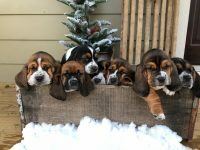 Bassets were first brought to America in the late 1880s. By the mid-1900s, the breed had become a popular pet. It was often used in advertising or entertainment due to its funny expressions. 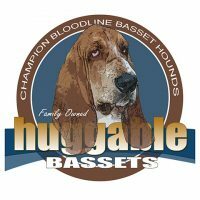 It remains a popular breed among hunters, dog fanciers, and families today.